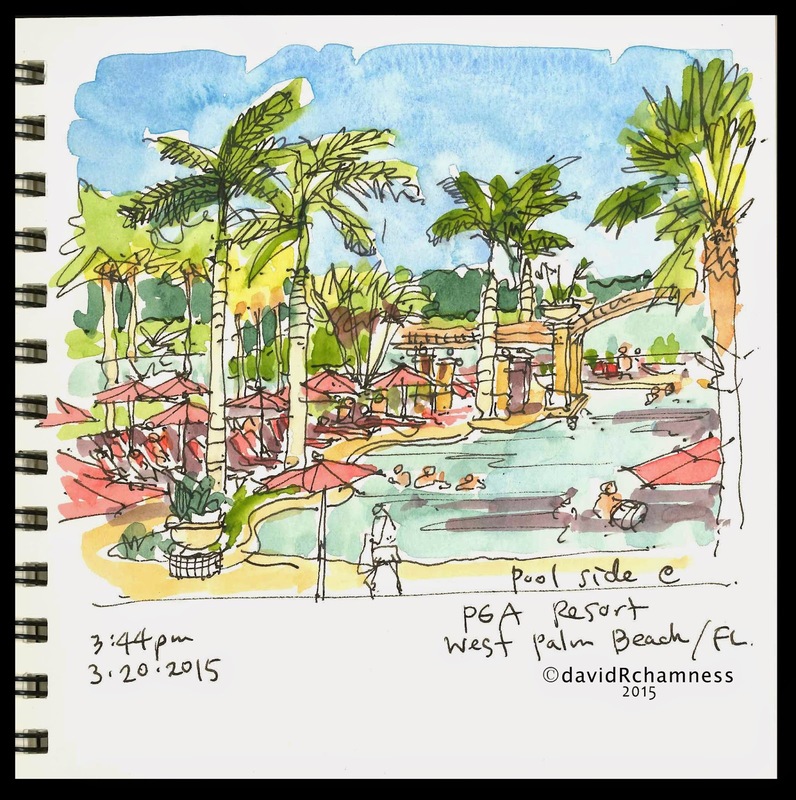 We took a trip to Florida in March to attend a conference and catch a few days of R&R at the end. We started the conference at the PGA Resort in West Palm Beach which had just hosted the Honda Classic Golf Tournament. Lots of golf enthusiasts, but not many sketchers. relax. 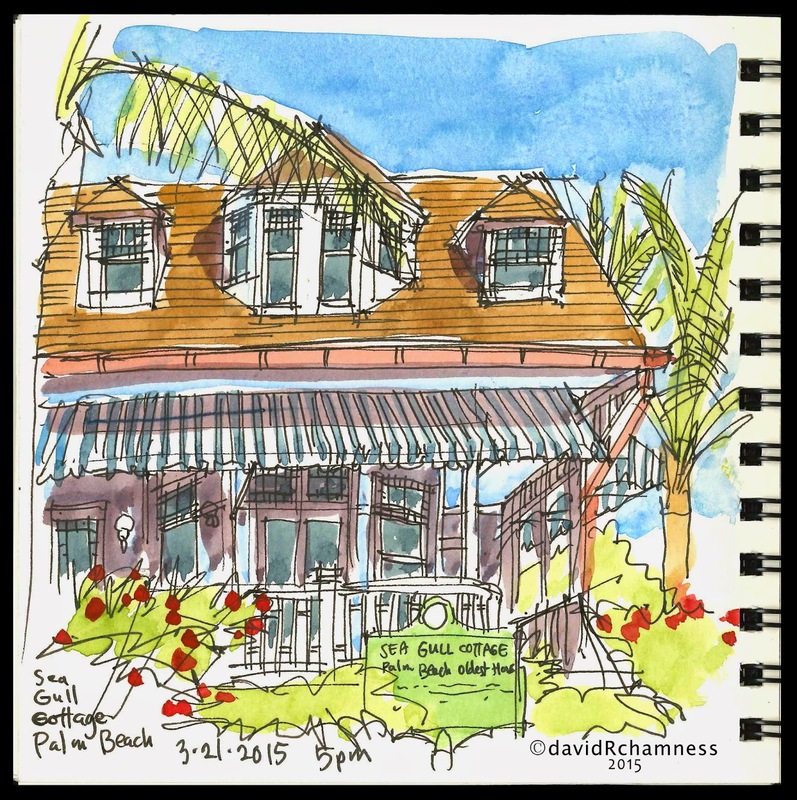 Every time I am sketching, I have someone stop and ask about what I am doing. This one women stopped and said she paints with oils and acrylics, but never thought about painting with watercolors while away from home. 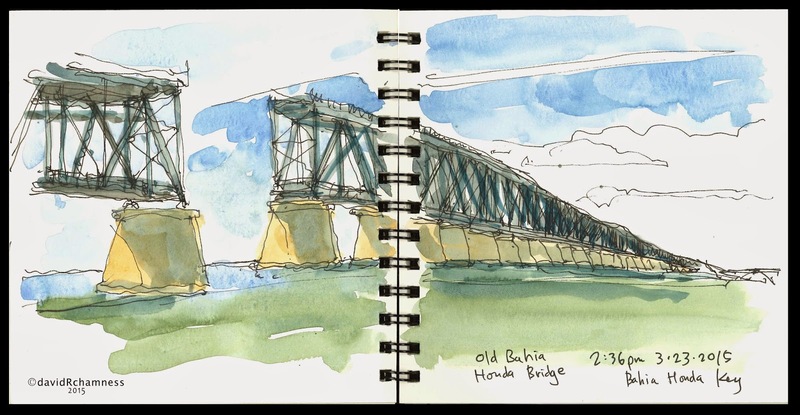 After talking about Urban Sketching, I think I converted her to try sketching and painting on location for herself. We got out for an afternoon to go into Palm Beach. 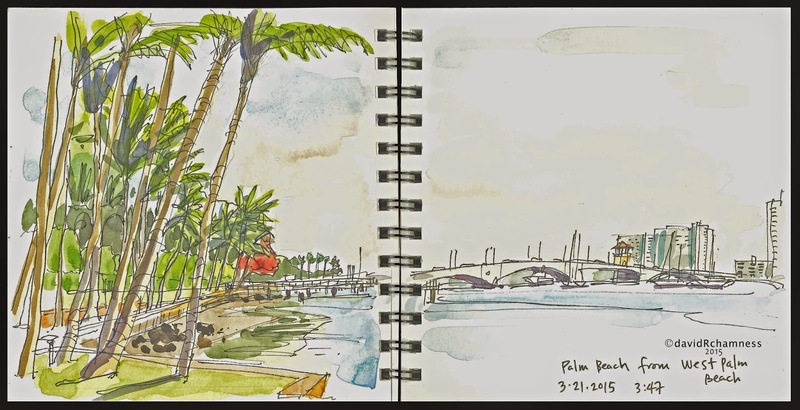 Palm trees and waterways were the main subjects of many of my sketches. 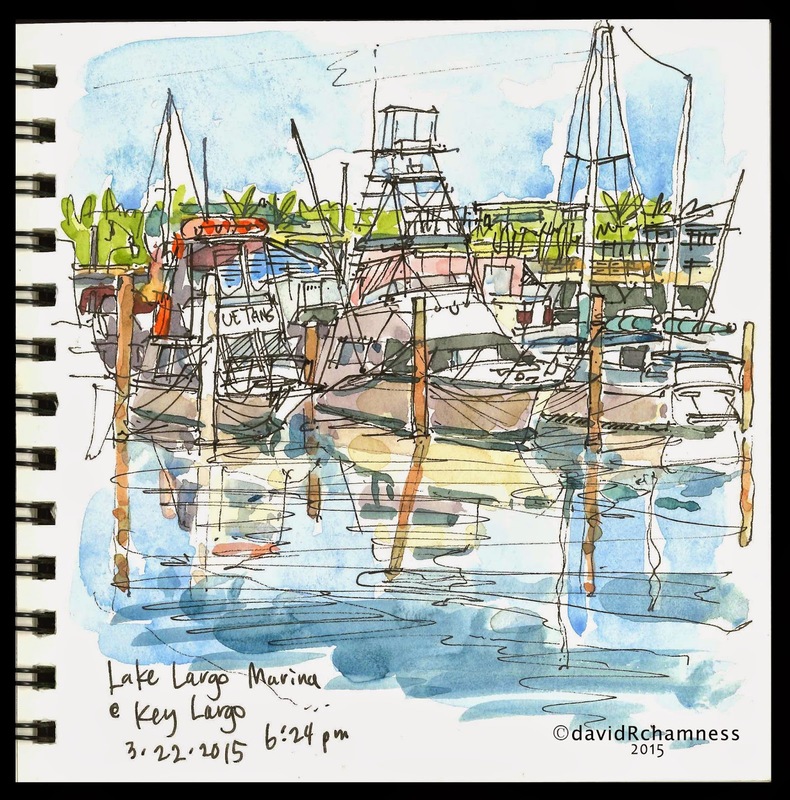 The last half of the trip we went down to the Florida Keys and stayed on a boat rather than get a hotel room. This was the view from the bridge to other boats in the marina. One day we went down the Keys, crossing the bridges between islands. The farthest south we reached was a mere 35 miles north of Key West at the Bahia-Honda State Park. The old bridge was still standing, but no longer used for cars. It was originally built for the railway to Key West in 1912 by Henry Flagler, one of the original organizers of Standard Oil. He was anticipating the opening of the Panama Canal and being as close as possible in the lower 48 to the shipping from the canal. 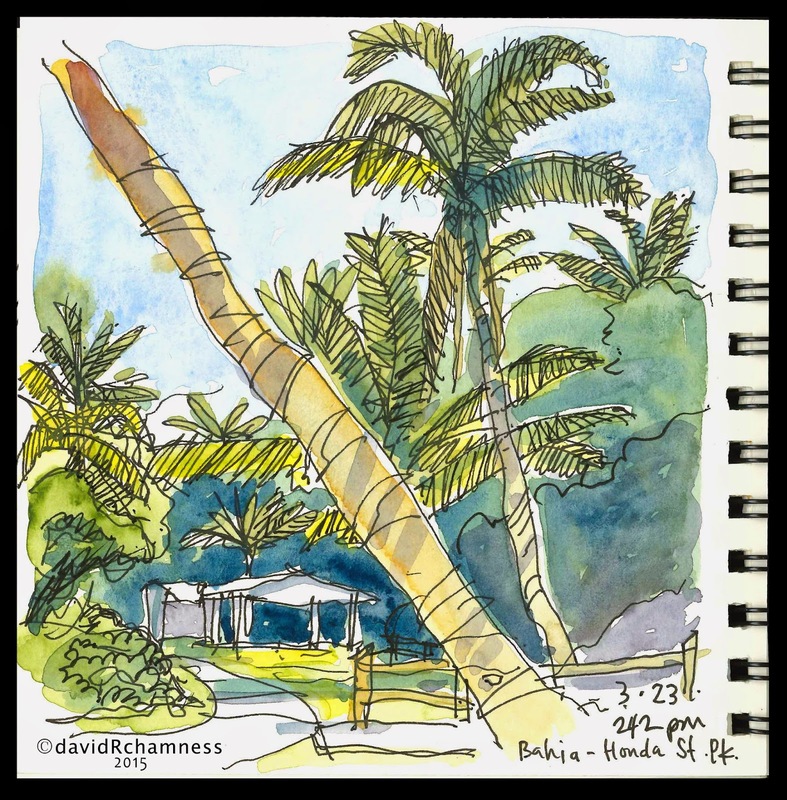 Here was my last sketch before we headed back to the Northwest..sunshine, palm trees and warm 85 degree temperatures! I love these sketches David! Great compositions and I love the Palm trees! 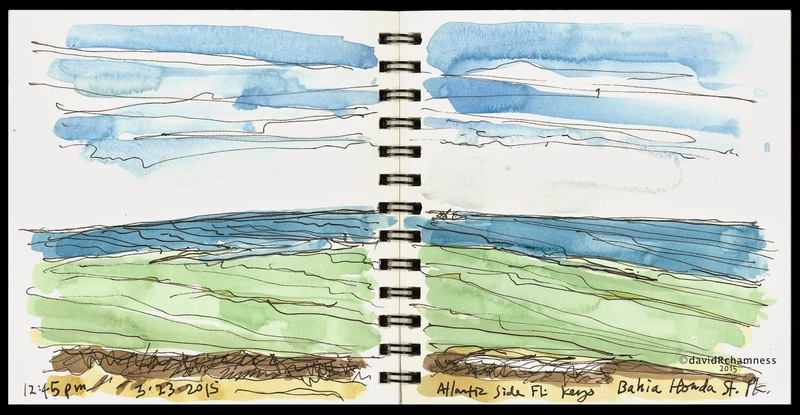 Some how sunny locations are a lot of fun to sketch. Oh, I used to live in Sarasota, FL and have been to some of these places. These simple renderings absolutely capture and communicate the spirit of each location and FL in general. Beautiful and inspiring!